Frequently Asked Questions – If we haven’t answered your question below, we would love to help - call or email us at any time. How much does MiniRinx cost? Each MiniRinx session costs $28.50 (plus HST). Our packages which are put together in ‘seasons’ – Fall, Winter, Spring/Summer and can be purchased 4 weeks in advance with an additional discount of one session for free. See our Fee Schedule for more information. How do I pay for MiniRinx? MinIRinx clients can pay via cheque, credit card, Paypal or e-transfer. Yes, if you would like to split your payments over the ‘season’ you have registered for, we are happy to provide that service to you. Please indicate this option on your registration form and we will connect with you to make it happen! Do you offer discounts for siblings? Yes, for two or more siblings, we offer $15.00 off each program. For beginners, what level of skating should my player be at? This is always a tricky question to answer. The best result is a player that wants to be there. In saying that, we do recommend that your player has had a bit of skating experience. They definitely don’t have to be perfectly skating around. Please email or call so we can help guide you on what you can expect. What if my player needs to switch programs? If we see that your player may do better in a program with different ages as outlined by our program, we will discuss this with you and your player so that we get the best fit. Can I pre-register for upcoming programs? Yes, if you would like to register for an upcoming season – Fall, Winter, Spring/Summer in your town, please send us an email with a request for your desired season and preferred rink. In addition, pre-registration is sent to MiniRinx clients or newsletter subscribers. You will be the first to know about programming and release dates and have the first opportunity to sign up. Can I choose the dates that I can make it to a program? Yes, we offer continuous enrollment, where there is space available. Can I join a program at any time? If you are interested in joining MiniRinx but your schedule is a limitation, we will gladly try to accommodate you – please email or call to reserve the specific dates that work for you and your player. All players (except TOTZ) need full hockey equipment for MiniRinx. Here is a checklist of what is required: Hockey Bag, Hockey Skates, Hockey Stick, Hockey Socks, Shin Pads, Hockey Pants, Jock/Jill, Chest & Shoulder Protector, Elbow Pads, Neck Guard, Mouth Guard, Helmet, Jersey, Hockey Gloves, Hockey Tape. I have a group/team that would like to join – do you give group rates? Yes, group rates are offered for teams of 5 or more. Please contact us directly or check out our Fee Schedule. How do I collect my Make a Friend a Player referral fee? Yes! 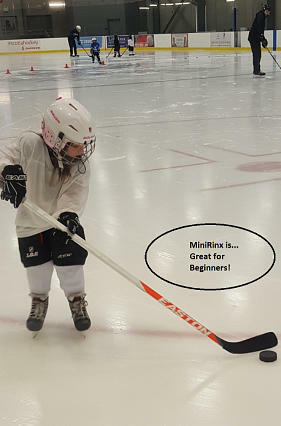 MiniRinx is excited to be offering lessons for players in their home town. If you would like to see MiniRinx come to you, please email us your request. I own/operator a Hockey School. Can I become a provider of MiniRinx? Yes! Becoming a MiniRinx Provider has benefits for hockey schools. Contact us at chantal@minirinx.com to receive information about requirements of becoming a provider. Do you provide Initiation Programs, First Shift or my teams practice? The MiniRinx team is happy to help design and build programs for your team or for the First Shift or Hockey Canada’s IP, Initiation Program or your teams practice. Send us a note and we will be happy to customize a program for you. 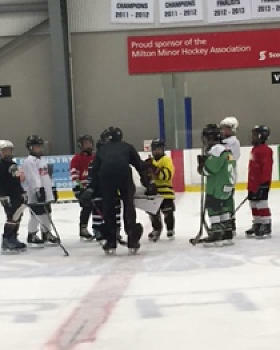 MiniRinx instructors are first and foremost current or former hockey players. All Head Instructors are Certified Coaches with at least 2-3 years Coaching experience and at least 10 years hockey playing experience. Station Instructors have played for at least 3 years and are at least 16 years of age. All of our instructors have to fulfill requirements of a recent Vulnerable Sector Screening (Police Check), Respect in Sport Certification and First Aid (Head Instructor). Who are MiniRinx Head Instructors? 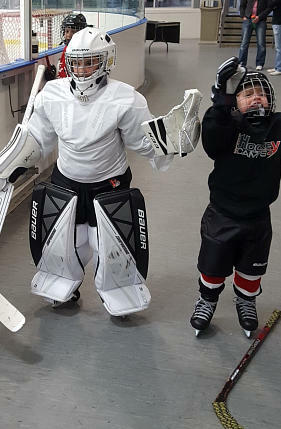 HEAD INSTRUCTORS lead the MiniRinx program and are Certified Coaches with a minimum of 2-3 years coaching experience and 10 years hockey playing experience. They love hockey and love teaching it. What certifications can I expect from your MiniRinx Instructors? Our instructors are required to have a recent Vulnerable Sector Screening (Police Check), Respect in Sport Certification at least one personnel on the ice with First Aid Certification. I am Interested in becoming an instructor, how do I apply? We would love to hear from you…! Please contact us at careers@minirinx.com and indicate your town of teaching preference. Do volunteers teach any MiniRinx programs? No, MiniRinx instructors are all employees. If there are volunteers on the ice, they will be used as extra hands on the ice above our 1:5 advertised Coach:Player ratio. These volunteers will be identified with a volunteer tag and will be screened the same as an employee. Do you have community placements to help a player experience hockey? Yes, MiniRinx Inc. is happy to help a player who may apply through community programs for a spot in a season of MiniRinx. These requests would first have to be approved through the community program (i.e. JumpStart) in your town or contact us directly at chantal@minirinx.com to see how we can assist your request. Can I give MiniRinx as a gift? Do you have MiniRinx gift cards? Yes, you can give MiniRinx as a gift and this can be done with a gift card. You may purchase a season or give a personalized amount to be used toward a program. Do you do school or group interactive presentation? MiniRinx Inc. is happy to come to your school or group and provide a ‘Dryland’ version (Ball Hockey) version of MiniRinx in your gym or outdoor space. This is ideal for any group looking for a fun way for their community to come together, learn hockey and have fun in a non-competitive environment and can include all levels and ages. This also works great for team building and corporate functions. Please contact chantal@minirinx.com for more information on our ‘Dryland’ MiniRinx. For more FAQ’s please visit our website. + How much does MiniRinx cost? + Do you offer discounts for siblings? + For beginners, what level of skating should my player be at? + What if my player needs to switch programs? + Can I choose the dates that I can make it to a program? + I have a group/team that would like to join - do you give group rates? + Who are MiniRinx Instructors? + Can I join a program at any time?